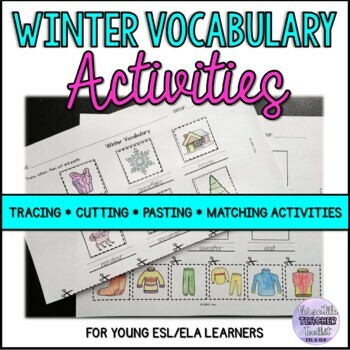 Winter vocabulary and Winter clothes tracing, matching, cutting and pasting activities for Grade 1-2 learners. 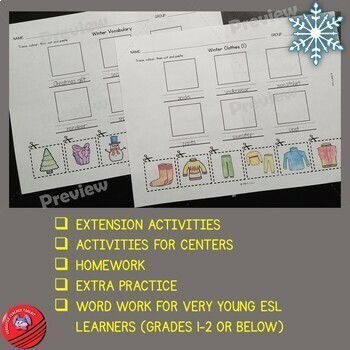 In Canada, these activities are perfect for your Grade 1 and 2 ESL learners. However, this resource may be useful for learners below or above these grade levels. Please, check out the preview file to determine if this resource is appropriate for your students. Resources may be in a zip, PPT or PDF file. Please make sure you can open these files. Pages are US Letter Paper Size format (8.5 x 11). Your feedback is highly appreciated as it helps me improve and create better resources. In addition, leaving feedback also gives you credits you can use on future TpT purchases. 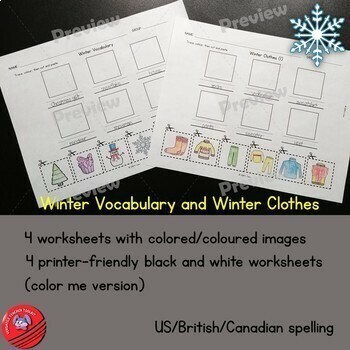 This product is copyright to K. Cana (Versatile Teacher Toolkit store). This resource may be used for personal and educational print purposes only. This document may not be shared with others, modified or posted on websites, blogs or sold as your own creation. This resource is for your personal and/or your own classroom use only.